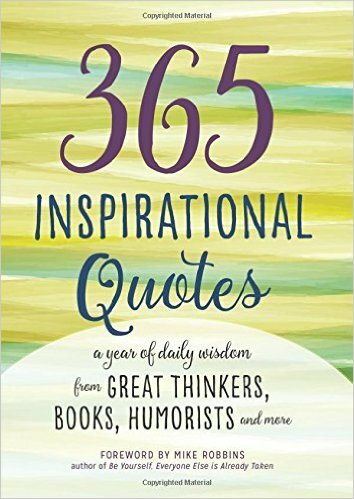 There’s no right or wrong way to read 365 Inspirational Quotes. Dive in from day one read it backwards or pick a page at random. Whatever your method, you’ll receive the same nuggets of inspiration covering a wide-range of themes: from embracing creativity to sustaining spirituality to falling in love―plus inspirational quotes tailored to the major U.S. holidays, and even some of the little ones (like April Fool's Day). Perfectly sized for a nightstand staple or an on-the-go guide, 365 Inspirational Quotes makes the ideal companion as you start or end your day―or whenever you need an uplifting pick-me-up. This is a great inspirational book of quotes. What I like most about this books is that it is color coded with the months of the year, the month and date are on top of each page. Some of the quotes really make you think and some will make you giggle. It's a cute book to have on your coffee table.